In this book, the author shows how the Western influence interacted with internal Ottoman social groups and dynamics to produce a “bifurcated bourgeoisie” - war led to the formation a bureaucratic bourgeoisie, while trade led to the formation of a commercial bourgeoisie. 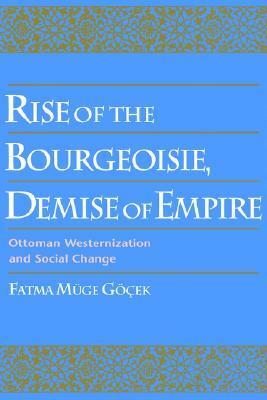 Separated across religious and ethnic lines, these two groups interpreted Western cultural influence differently, producing diverging visions of modernity and it was ultimately the bureaucratic bourgeoisie that shaped the future Turkish Republic.She starts by describing the Ottoman social structure, which is organized around the household of the sultan, ”ranging in size from a hundred to thousands of members symbolically residing under one roof, comprises kin, retainers, and servants, all drawn from different segments of society” (p.18). The officials replicate this structure and create their own office-households, with the help of which they try to wrestle resources out of the sultan’s control. In response to this, the padișah tries to create a class of bureaucrats loyal to himself by establishing Western-style schools where to educate them. Another reason for this is military: the consecutive defeats suffered by the Empire convinced the sultan of the need to reform the army along Western-style lines, which also implied the creation of schools where military officers would be trained accordingly. According to Göçek, this is how the Ottoman bureaucratic bourgeoisie is born. Instilled with Western ideas and values, this cohort of students and future officials develops a loyalty towards the abstract idea of an Ottoman motherland and state, instead of the personal loyalty to the sultan that characterized previous generations. Also, thanks to their education, skills, knowledge and the network of relationships formed in the meanwhile, these new bureaucrats are in possession of a social capital that cannot be confiscated to the sultan. Another group that starts to accumulate resources outside of the control of the sultan are the ethnic minorities - Greeks, Armenians, Jews and Arab Christians. As wars become more expensive, the Empire plummets into debt and is forced to concede commercial and tax privileges to other countries and their merchants. In this context, the Ottoman minorities emerge as commercial intermediaries who use this trade imbalance to amass significant economic resources and gain the political protection of foreign powers, thus escaping the control of the sultan. This is what allows an Ottoman commercial bourgeoisie to emerge from the minority groups, but also what separates it from the Turkish bureaucratic bourgeoisie. Although both groups shared ”the secular principles of the Enlightenment, the religious and ethnic boundaries separating them became insurmountable due to the historical conjuncture: as the Empire lost lands, migrating ethnic Turk populations from lost provinces fueled Turkish/Turkic nationalism. At the same time, the minorities’ continuous association with foreign powers made their allegiance to the Ottoman motherland questionable in the eyes of the Turkish bureaucratic bourgeoisie. As a result, the Ottoman bureaucracy was ethnically, religiously and functionally divided and this division had a crucial influence on the outcome of the Ottoman social and political transformation: the rise of secular nationalistic Turkish state, from which the minorities are removed.The academic self-awareness of the book dulls the process of reading a little, constantly puts some distance between reader and book and prevents us from immersing into the story. Of course, academic books should not be judged by the same standards as belletristic books, but it doesn’t mean they cannot be an enjoyable read as well.This is not to say that this is a difficult book to read for non-academics. On the contrary, the language is mostly accessible, the structure of the book is simple and logical, so the main ideas can be easily followed by anyone. Also, the author is actually pretty repetitive about her main ideas, highlighting them over and over again, so that even the most unattentive reader will remember how the Ottoman bifurcated bourgeoisie emerged. Great analysis of the Ottoman Westernization from an unbiased perspective. Thanks for the book!